I decided to review all these children’s books together because they are similar in many ways, and also, quite different than the first book in the series, Sandry’s Book. Sandry’s Book was a lovely introduction to the four children with magical powers, and was perfect for younger readers. However, with each of the subsequent children’s books, the action is far more fast-paced, and also filled with many more difficulties, including death, treachery, plagues, and on and on. As a result, I definitely recommend these books for more mature readers. I would say 12 and up, though obviously there are 11-year-olds who could handle the material. Despite the addition of so much death and dying, the writing is still exceptional and compelling. I had an odd feeling as I read each book… the feeling of being carried along even if I couldn’t really figure out what was going on in any one scene. The scenes and magic are quite complex, but the writing is so magical that you just sort of ‘feel’ what’s happening, rather than intellectually figuring it out. I can’t express it any better than that. The result, however, is that you take one long inhalation, journey forward, and finally let your breath out at the satisfying conclusion. 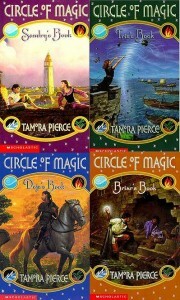 I loved Book 1 the best, and then, out of the choice of Books 2, 3, and 4, I was most satisfied with Book 3, Daja’s Book, and least satisfied with Book 4, Briar’s Book. But I’m glad I read them all- I love the characters and I think many children will too.